Zack Snyder is quickly becoming WB's darling. He's already done 300, Watchmen and currently in theaters Legends of the Guardians: The Owls of Ga'Hoole for Warner Bros. He's also currently in post production on his first written and directed film for the studio, "Sucker Punch" and now it looks like he will jump right into 'The Man of Steel.' The decision to hire Snyder for Superman does not come as a shock. Like I said, he's becoming WB's darling and he's certainly got the vision to handle a character of this scope and magnitude. Anyone undercutting his potential is just lying to themselves. There is no use contemplating who could have been a better choice because the ink is drying. Now that the deal is done, I just hope that Snyder is able to pull back the reigns on his slo-mo style or as I call it Snyder-vision. That is not to say I don't like his style, because I do, I just know he can have a heavy hand with it at times. I've actually told the Mr. Snyder in person my feelings on how much I love his visual style but that he has at times used it too much. Honestly, I can't wait to see a slo-mo punch of Superman through the eyes of Snyder. Let's just not do it every time Superman takes off or lands. The fact that Snyder will have Christopher Nolan looking over his shoulder should also help to alleviate any worries pundits have against the talented director. With Nolan "mentoring" I think we can expect a Superman film that will make money while also appealing to everyone. Well at least I hope so. It was painful to be re-introduced to the character only to see the majority not impressed. I stand outside that majority on Superman Returns and I really enjoy it. Not sure I can take the promise of Superman back in theaters only to have it not go over well again. With Nolan's vision and wisdom matched with Snyder's vision and passion I think "Superman: The Man of Steel" has the potential to be well, super! 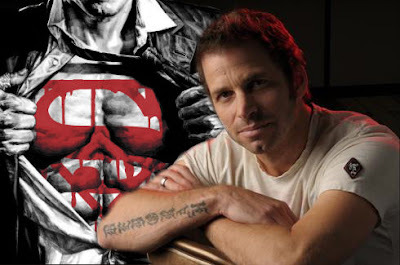 Outside of Zack Snyder being hired as director, there is very little other news to report. Snyder is currently in post on 'Sucker Punch' and until that is finished, I'm sure their won't be too much change to that. What we do know is David Goyer is writing the script, a script that is not finished and one that Snyder will most likely "work on" before shooting. Last we heard there was no chance Brandon Routh would be back in tights and WB will be looking for someone else to fill the Super boots. Snyder tells Hero Complex, "He has to be a man." It is also reported by THR's blog Heat Vision that General Zod will be the villain. I've always loved Zod in Superman II, but until we know more about the current script it is hard to gauge anything on this property. I remember reporting previously that this installment could see an aged Superman, but there is no current validity to that idea outside of Snyder calling him a "man." Everything for now is mere speculation. One thing is for certain both Snyder and Nolan are visionaries and with the two of them together, I'm more than willing to pay come release day to see just what they've done.